Motorola’s heritage is vast; building the first handheld F.M. radio for our military to use during World War II; transmitting Neil Armstrong's first words when he stepped on the moon, and even developing the first handheld cellular device back in 1980. Their success in wireless communication is no coincidence. Their absolute dedication to deliver products with the highest standards in quality control, durability, and technology makes up the Motorola standards, they are so well know for. The Six Sigma process was created as a data-driven approach to eliminating defects to ensure a higher quality product is delivered to the customer. It was created in 1986, when Motorola want to eliminate product defects from production, once finalized and put into practice, Six Sigma decreased production defects with such success, any defects left became statistically insignificant. In addition to ensuring a higher-quality product, the Six Sigma process generated strong bottom-line results for Motorola, and is documented to have saved them over 16 billion in the last 30+ years. First starting out specifically as a Motorola Quality Control method, Six Sigma was quickly adopted by competitors to show how their products compared to Motorola’s. From there, the process only spread in popularity; now being the industry standard for measuring the quality of all manufactured goods across the globe. Motorola radios not only have to pass the Six Sigma standards for quality, but they also have to pass the Accelerated Life Testing, to prove their durability, in a series of intense tests designed to simulate 5 years of wear and tear on the unit. During these tests, products are put in extreme environments to determine their strength and reliability. The tests adhere to strict laboratory guidelines to guarantee consistency from one radio to another, to ensure no discrepancies in results. Each test is performed with the exact same conditions, and test the radios for all types of conditions; such as, water resistance, extreme temperature, vibration and shock, rusting and corrosion, cable bending & durability, and solar radiation tests. It is due to these strict requirements and standards that Motorola has earned the reputation of building the best products in the business. This is also reflected in the MIL-STD and IP ratings that their radios earn, with even their smallest radios usually carrying at least an IP54 rating for dust and water protection. Research and development is one of Motorola’s top priorities, with upwards of 14,000 employees and dozens of facilities around the world dedicated to R&D alone. 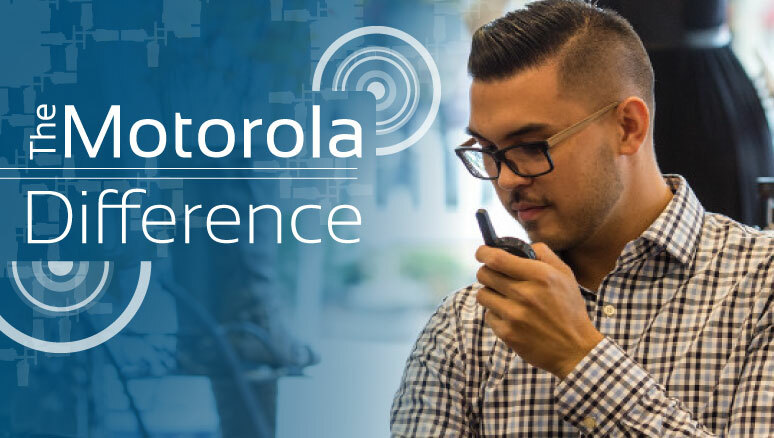 Motorola invests millions into their research and development efforts each year, so they can develop better, more innovative ways to solve their customers’ communication needs. Motorola understands that customers are using this technology on a daily basis, so no one knows better what could be done to make improvements to products and software. That is why before developing a new radio, Motorola pulls in seasoned radio users and customers to get their feedback and bounce concepts off around throughout the entire engineering and designing phase; truly making their radios designed by customers, for customers. Their business model puts the customers’ needs at the center of everything they do; the true starting point for all engineering and production projects. They even utilize a recognition program that rewards team members for developing new ways to improve a product or service, with the goal of gaining the customer's satisfaction; reiterating the structure of putting the customer at the heart of all they do. One of the newest radios released by Motorola is the perfect example of the modern innovations that Motorola’s engineers continue to deliver...The Motorola SL300. The SL300 is a lightweight, discrete radio known for it’s slim chassis - less than an inch thick - yet it has earned the IP54 rating for dust and water protection. It is ideal for use in a professional setting, such as an office, hospitality or retail industries, and can also handle the rigors of manufacturing and distribution. The radio’s chassis also holds a secret... the screen. The Active View Display of the SL300 is housed underneath the skin of the radio for protection. This display is one of a kind, specific only to the SL300 & the brand new SL3500e; giving the customers the convenience of displayed information; such as, setting changes, channels and volume level, without the worry of breaking traditional screens from simple drops. Learning the basic controls for the SL300 is made to be easy as well. It has is a toggle switch, which allows quick changes between up to 99 channels. Also included on the radio is the side volume control & programmable buttons and a top power button, all made to use quickly with one-handed accessibility. The Motorola SL300 is one of the most popular radios on the market today, and could quickly become your new and most reliable work partner.